The International Space Station may look large in this picture, but it has come from humble beginnings. The very first module named Zayra was launched by the Russian Space Agency (Roscosmos), from the Baikonur Cosmodrome aboard a Russian Proton rocket in 1998. Following the placement of the first module in orbit, NASA launched the American Unity node aboard Space Shuttle Endeavour on the STS-88 mission. The joining of those two modules has kicked off cooperation not really seen before. The major partners of the ISS include: NASA, Roscosomos, JAXA (Japan), CSA (Canada), and ESA (Belgium, Denmark, France, Germany, Italy, Netherlands, Norway, Spain, Sweden, Switzerland and the United Kingdom). The ISS required more than 115 space flights to construct utilizing five different launch vehicles. It has a footprint about the size of an American football field, including the end-zones. The 15 pressurized modules have an internal pressurized volume of 32,333 cubic feet and a habitable volume of 13,696 cubic feet. This roughly translates to a living space larger than a five bedroom house, or larger than the interior of a 747. There is a lot of hardware to support that much volume. 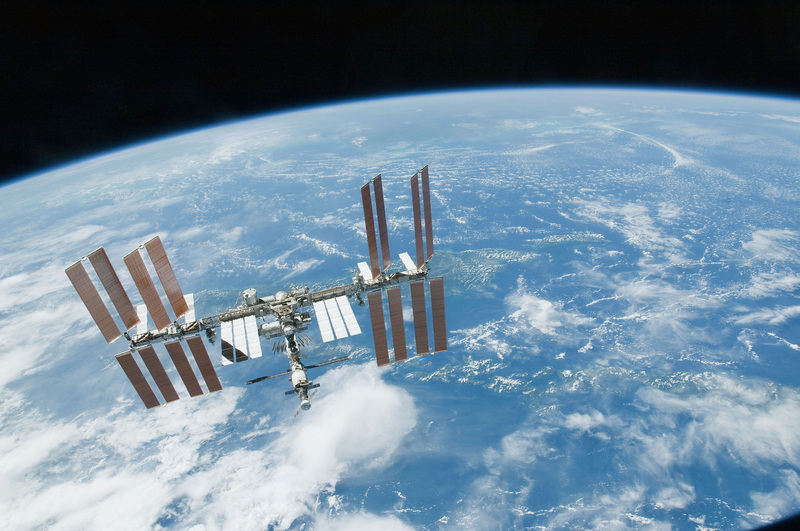 If the ISS was sitting on Earth instead of in orbit, it would weigh 925,000 pounds. This much space allows over 100 telephone booth sized racks for operating spacecraft systems and research. In order to power this facility it has eight solar panels capable of an output of 75 to 90 kilowatts. The station is much more than just hardware. It is normally staffed by a crew of six. At present, Expedition 35 is currently on board. They are: Commander Chris Hadfield, and flight engineers Tom Marshburn, Roman Romanenko, Chris Cassidy, Alexander Misurkin, and Pavel Vinogradov. This human presence in space, on this vehicle, has remained uninterrupted since October 31, 2000. If you are out at night and you see a bright star racing across the sky, what you are likely seeing is the International Space Station. It stands as a testament to what mankind can do when working together toward a common goal. You can find more information about the ISS at the link below, as well as ways to be alerted when it will be visible overhead in your area. Anthony Fitch is a graduate of Morehead State University with a Bachelor’s Degree in Computer Science but technology is just one is his many passions; aerospace is another one of them. After getting interested in volunteer work with SpaceUp Houston where he served on and director of the IT team for 3.5 years, and attending more than a few rocket launches, he now works with RocketSTEM as a writer and photographer. You can find more information about Anthony Fitch at his website http://www.anthonyfitch.com as well as links to any social media platforms he is on.